This is a list of potentially habitable exoplanets and possible exoplanets. The list is based on estimates of habitability by the Habitable Exoplanets Catalog (HEC), and data from the NASA Exoplanet Archive. The HEC is maintained by the Planetary Habitability Laboratory at the University of Puerto Rico at Arecibo. Surface planetary habitability is thought to require orbiting at the right distance from the host star for liquid surface water to be present, in addition to various geophysical and geodynamical aspects, atmospheric density, radiation type and intensity, and the host star's plasma environment. In astronomy and astrobiology, the circumstellar habitable zone (CHZ or sometimes "ecosphere", "liquid-water belt", "HZ", "life zone" or "Goldilocks zone") is the region around a star where a planet with sufficient atmospheric pressure can maintain liquid water on its surface. A potentially habitable planet implies a terrestrial planet within the circumstellar habitable zone and with conditions roughly comparable to those of Earth (i.e. an Earth analog) and thus potentially favourable to Earth-like life. However, the question of what makes a planet habitable is much more complex than having a planet located at the right distance from its host star so that water can be liquid on its surface: various geophysical and geodynamical aspects, the radiation, and the host star's plasma environment can influence the evolution of planets and life, if it originated. A 2015 review concluded that the exoplanets Kepler-62f, Kepler-186f and Kepler-442b were likely the best candidates for being potentially habitable. These are at a distance of 1,200, 490 and 1,120 light-years away, respectively. Of these, Kepler-186f is similar in size to Earth with a 1.2-Earth-radius measure and it is located towards the outer edge of the habitable zone around its red dwarf. This is a list of the exoplanets that are more likely to have a rocky composition (which according to current research requires a radius of less than 1.6 R⊕ and a mass less than 6 M⊕) and maintain surface liquid water (i.e. between 0.5 and 1.5 R⊕ and between 0.1 and 5 M⊕, and orbiting within the conservative habitable zone). Note that this does not ensure habitability, and that * represents an unconfirmed planet or planet candidate. Earth is included for comparison. This is a list of the exoplanets that are less likely to have a rocky composition or maintain surface liquid water (i.e. 0.5 < planet's radius ≤ 1.5 Earth radii or 0.1 < planet's minimum mass ≤ 10 Earth masses, or the planet is orbiting within the optimistic habitable zone). Note that this does not ensure habitability, and that * represents an unconfirmed planet or planet candidate. HD 85512 b was initially estimated to be potentially habitable, but updated models for the boundaries of the habitable zone placed the planet within the HZ, and it is now considered non-habitable. Kepler-69c has gone through a similar process; though initially estimated to be potentially habitable, it was quickly realized that the planet is more likely to be similar to Venus, and is thus no longer considered habitable. Similarly, Tau Ceti f was initially considered potentially habitable, but the improved model of the circumstellar habitable zone places the planet exterior to the outer limits of habitability, so it is now considered non-habitable. KOI-1686.01 was also considered a potentially habitable exoplanet after its detection in 2011, until proven a false positive by NASA in 2015. (Kepler Space Telescope; 6 January 2015). 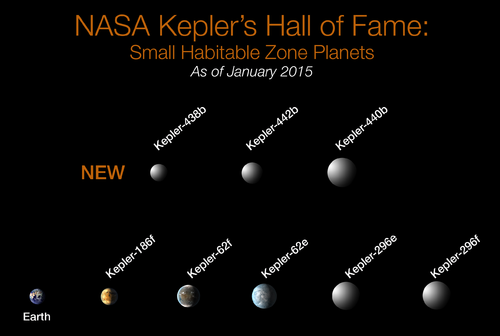 Comparison of small planets found by Kepler in the habitable zone of their host stars. ^ "Habitable Exoplanets Catalog". University of Puerto Rico at Arecibo. 2015. Retrieved 3 June 2015. ^ a b Lammer, H.; Bredehöft, J. H.; Coustenis, A.; Khodachenko, M. L.; et al. (2009). "What makes a planet habitable?" (PDF). The Astronomy and Astrophysics Review. 17: 181–249. Bibcode:2009A&ARv..17..181L. doi:10.1007/s00159-009-0019-z. Archived from the original (PDF) on 2016-06-02. Retrieved 2016-05-03. ^ "The Goldilocks Zone". NASA. 2 October 2003. ^ Overbye, Dennis (4 November 2013). "Far-Off Planets Like the Earth Dot the Galaxy". New York Times. Retrieved 5 November 2013. ^ Petigura, Erik A.; et al. (31 October 2013). "Prevalence of Earth-size planets orbiting Sun-like stars". Proceedings of the National Academy of Sciences of the United States of America. 110: 19273–19278. arXiv:1311.6806. Bibcode:2013PNAS..11019273P. doi:10.1073/pnas.1319909110. PMC 3845182. PMID 24191033. Retrieved 5 November 2013. ^ Gilster, Paul; LePage, Andrew (30 January 2015). "A Review of the Best Habitable Planet Candidates". Centauri Dreams, Tau Zero Foundation. Retrieved 24 July 2015. ^ Gilster, Paul; LePage, Andrew (14 November 2014). "The Transition from Rocky to Non-Rocky Planets". Centauri Dreams, Tau Zero Foundation. Retrieved 17 October 2017. ^ LePage, Andrew (3 January 2015). "The Composition of Super-Earths". Drew Ex Machina. Retrieved 17 October 2017. ^ Anglada-Escudé, Guillem; et al. (2016). "A terrestrial planet candidate in a temperate orbit around Proxima Centauri" (PDF). Nature. 536 (7617): 437–440. arXiv:1609.03449. Bibcode:2016Natur.536..437A. doi:10.1038/nature19106. ISSN 0028-0836. PMID 27558064. ^ Feroz, F.; Hobson, M. P. (2014). "Bayesian analysis of radial velocity data of GJ667C with correlated noise: evidence for only two planets". Monthly Notices of the Royal Astronomical Society. 437 (4): 3540–3549. arXiv:1307.6984. Bibcode:2014MNRAS.437.3540F. doi:10.1093/mnras/stt2148. ^ "Confirmed Planet Overview Page: Kepler-452 b". NASA Exoplanet Archive. NASA Exoplanet Science Institute. Retrieved 4 June 2016. ^ "Confirmed Planet Overview Page: Kepler-62f". NASA Exoplanet Archive. NASA Exoplanet Science Institute. Retrieved 4 June 2016. ^ a b c d Delrez, Laetitia; Gillon, Michael; H.M.J, Amaury; Brice-Oliver Demory, Triaud; de Wit, Julien; Ingalls, James; Agol, Eric; Bolmont, Emeline; Burdanov, Artem; Burgasser, Adam J.; Carey, Sean J.; Jehin, Emmanuel; Leconte, Jeremy; Lederer, Susan; Queloz, Didier; Selsis, Franck; Grootel, Valerie Van (9 January 2018). "Early 2017 observations of TRAPPIST-1 with Spitzer". arXiv:1801.02554 [astro-ph.EP]. ^ a b c d Grimm, Simon L.; Demory, Brice-Olivier; Gillon, Michael; Dorn, Caroline; Agol, Eric; Burdanov, Artem; Delrez, Laetitia; Sestovic, Marko; Triaud, Amaury H.M.J. ; Turbet, Martin; Bolmont, Emeline; Caldas, Anthony; de Wit, Julien; Jehin, Emmanuel; Leconte, Jeremy; Raymond, Sean N.; Van Grootel, Valerie; Burgasser, Adam J.; Carey, Sean; Fabrycky, Daniel; Heng, Kevin; Hernandez, David M.; Ingalls, James G.; Lederer, Susan; Selsis, Franck; Queloz, Didier (5 February 2018). "The nature of the TRAPPIST-1 exoplanets". arXiv:1802.01377 [astro-ph.EP]. ^ Dickinson, David (19 April 2017). "Welcome to LHS 1140b: A Super-Earth in the Habitable Zone". Sky & Telescope. Retrieved 17 October 2017. ^ Torres, Guillermo; Kane, Stephen R.; Rowe, Jason F.; Batalha, Natalie M.; Henze, Christopher E.; Ciardi, David R.; Barclay, Thomas; Borucki, William J.; Buchhave, Lars A. "Validation of Small Kepler Transiting Planet Candidates in or near the Habitable Zone". The Astronomical Journal. 154 (6). arXiv:1711.01267. Bibcode:2017AJ....154..264T. doi:10.3847/1538-3881/aa984b. ^ "Confirmed Planet Overview Page: Kepler-296e". NASA Exoplanet Archive. NASA Exoplanet Science Institute. Retrieved 4 June 2016. ^ "Confirmed Planet Overview Page: Kepler-62e". NASA Exoplanet Archive. NASA Exoplanet Science Institute. Retrieved 4 June 2016. ^ "Confirmed Planet Overview Page: K2-3d". NASA Exoplanet Archive. NASA Exoplanet Science Institute. Retrieved 4 June 2016. ^ "Confirmed Planet Overview Page: K2-18 b". NASA Exoplanet Archive. NASA Exoplanet Science Institute. Retrieved 4 June 2016. ^ "Confirmed Planet Overview Page: Kepler-61 b". NASA Exoplanet Archive. NASA Exoplanet Science Institute. Retrieved 4 June 2016. ^ "Confirmed Planet Overview Page: Kepler-22 b". NASA Exoplanet Archive. NASA Exoplanet Science Institute. Retrieved 4 June 2016. ^ "Confirmed Planet Overview Page: K2-9b". NASA Exoplanet Archive. NASA Exoplanet Science Institute. Retrieved 4 June 2016. ^ "Confirmed Planet Overview Page: Kepler-296 f". NASA Exoplanet Archive. NASA Exoplanet Science Institute. Retrieved 4 June 2016. ^ Wenz, John (15 November 2017). "A potentially habitable planet has been discovered just 11 light-years away". Astronomy. Retrieved 19 November 2017. ^ "HADES RV Programme with HARPS-N at TNG: V. A super-Earth on the inner edge of the habitable zone of the nearby M-dwarf GJ 625". A. Suárez Mascareño , J. I. González Hernández , R. Rebolo, S. Velasco, B. Toledo-Padrón, L. Affer , M. Perger, G. Micela, I. Ribas, J. Maldonado , G. Leto , R. Zanmar Sanchez , G. Scandariato , M. Damasso , A. Sozzetti , M. Esposito , E. Covino , A. Maggio , A. F. Lanza , S. Desidera, A. Rosich , A. Bignamini, R. Claudi, S. Benatti, F. Borsa, M. Pedani, E. Molinari, J. C. Morales , E. Herrero , and M. Lafarga (May 18, 2017). ^ "Confirmed Planet Overview Page: HD 219134 g". NASA Exoplanet Archive. NASA Exoplanet Science Institute. Retrieved 14 February 2018. ^ Kaltenegger, L.; et al. (2011). "A Habitable Planet around HD 85512?". arXiv:1108.3561. Bibcode:2011arXiv1108.3561K. ^ Mendez, Abel (1 August 2012). "Five Potential Habitable Exoplanets Now" (Press release). Planetary Habitability Laboratory @ UPR Arecibo. Retrieved 4 June 2015. ^ Mendez, Abel (29 January 2013). "A New Habitable Zone" (Press release). Planetary Habitability Laboratory @ UPR Arecibo. Retrieved 4 June 2015. ^ Barclay, Thomas; et al. (2013). "A super-Earth-sized planet orbiting in or near the habitable zone around Sun-like star". The Astrophysical Journal. 768: 101. arXiv:1304.4941. Bibcode:2013ApJ...768..101B. doi:10.1088/0004-637X/768/2/101. ^ Kane, Stephen R.; et al. (2013). "A Potential Super-Venus in the Kepler-69 System". The Astrophysical Journal. 770: L20. arXiv:1305.2933. Bibcode:2013ApJ...770L..20K. doi:10.1088/2041-8205/770/2/L20. ^ Mendez, Abel (28 December 2012). "Two Nearby Habitable Worlds?" (Press release). Planetary Habitability Laboratory @ UPR Arecibo. Retrieved 4 June 2015. ^ "Kepler Candidate Overview Page: KOI-1686.01". NASA Exoplanet Archive. NASA Exoplanet Science Institute. Retrieved 28 December 2015. ^ Clavin, Whitney; et al. (6 January 2015). "NASA's Kepler Marks 1,000th Exoplanet Discovery, Uncovers More Small Worlds in Habitable Zones". NASA. Retrieved 6 January 2015.